Click here to read about the importance of practicing your craft (or read below). How can we make our work live up to our ambitions? As writers, we set the bar high. It may seem that our best writing is always just out of reach. We’re debilitated by writer’s block, plagued by self-doubt, crushed by criticism from others. There’s a lot standing in the way between the story sketch in our heads and the polished, final draft we know we’ve got inside us. 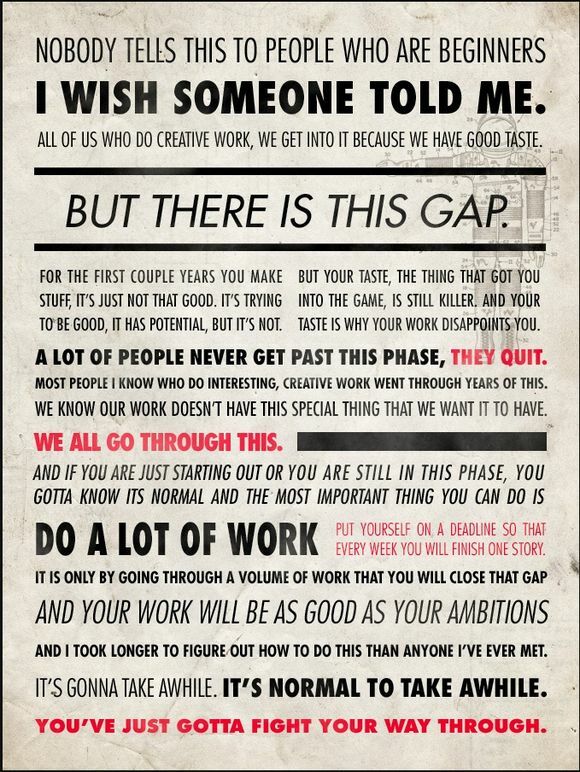 What distinguishes successful writers from the rest is persistence, according to Ira Glass. The Host and Executive Producer of This American Life believes that to go from good to great work, you simply have to do a lot of it. That feeling of inadequacy that gnaws at you after completing a first draft– it’s normal. It’s part of your growth process as a writer, and it proves you have something Glass likes to call “taste.” In other words, you have high standards for the work you produce, and you’re unwilling to settle for less. Hold onto that feeling, and let it drive you to create more. Glass himself began a career in public radio as a 19 year-old, and over the course of 17 years worked on nearly every NPR news show and on all kind of production jobs. He’s been a tape-cutter, desk assistant, newscast writer, editor, producer, reporter, and substitute host. All that led him to launch This American Life in 1995. Today’s it’s broadcast on 500 public radio stations across the country, with about 1.7 million listeners.